Preheat oven to 350F. Heat the oil in a 10″ skillet or larger cast iron skillet over medium heat. Add garlic and scallions; cook, until soft, 3 to 4 minutes. Stir in tomato paste; cook for 3 minutes. Add wine; cook until reduced by half, 6 to 8 minutes. Add oregano, sugar, chili flakes, and tomatoes; boil. Reduce heat to medium-low and cook, stirring often, until slightly thickened, 20 minutes. 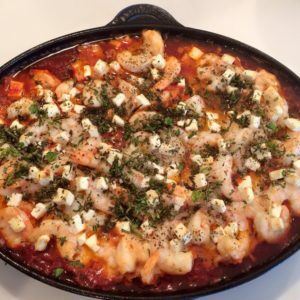 Stir in mint, lemon zest and shrimp, season with salt and pepper; crumble feta over top. Bake until bubbly, about 15 minutes. Squeeze lemon over top. Garnish with the minced parsley.